If I didn‘t see it, I wouldn‘t believe it! This great tool helps me look way cool to my Board of Directors! Zebra BI visuals are extremely powerful and simple to use. You are able to build sophisticated reports within minutes. What I like best is the interactivity. Not only can you click on data to update all other visuals on the report, but you can also toggle between different chart types at a click of the mouse all within the same visual! BARC, the Business Application Research Center, and HICHERT+FAISST confirm, Zebra BI Visuals for Power BI 1.2 has successfully passed the examination in accordance with the provisions of the IBCS® software certification process in June 2018. 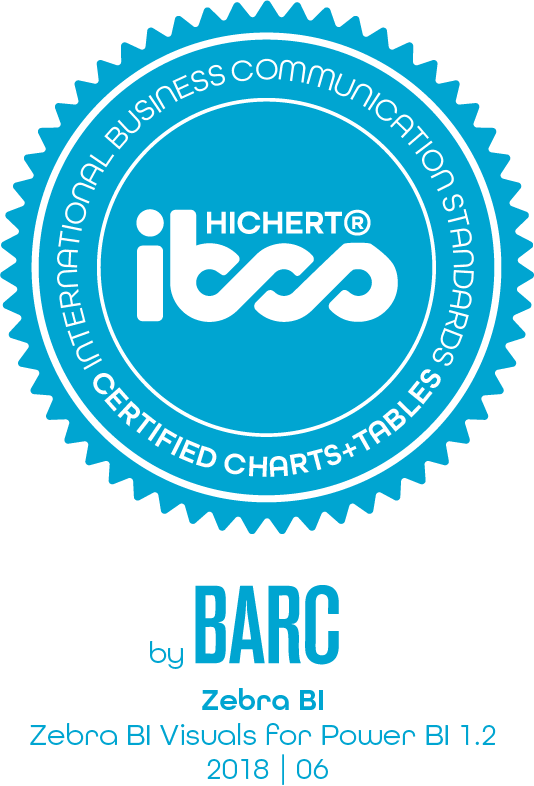 The visual design of the presented business charts and tables is certified to be compliant with the Standards proposed by the IBCS Association. The certification team was most impressed by what we would like to call “business-responsive design”: Zebra BI Visuals for Power BI dynamically creates IBCS® compliant charts providing a maximum of business insight within a given space. Get your free trial at Zebra BI.